This is the first of a three-part series involving rules that relate to pitched, thrown and batted balls that are deflected into dead ball territory or remain in play. In this edition, I’ll cover deflections that go into dead ball territory on throws from the outfield or batted balls that deflect off the outfielder and go into DBT. Whenever a thrown, pitched, or batted ball is deflected into dead ball territory, umpires must be able to make the proper base award and coaches should be able to determine if the base award was proper. This can impact the outcome of a game. Take what occurred when the Miami Marlins and Tampa Bay Rays played at the Trop on July 20, 2018. Miami broke open a five-run lead in the seventh. Following Derek Dietrich’s one-out, three-run homer, Brian Anderson walked before J.T. Realmuto smashed a double to left field off the wall. Rays’ left fielder Jake Bauers had difficulty handling the ball before he picked it up and fired to shortstop Adeiny Hechavarria, who booted the ball to third baseman Daniel Robertson, who in turn, accidentally kicked it into the camera well. The only throw made on the play was by Bauers. Both Anderson and Realmuto were awarded home. The two runs were critical as the Marlins won the game, 6-5. Did the umpires handle the play properly? Rule 5.06 (b) (4) (H) in the Official Baseball Rules and Sections 19 and 20 of the 2018 MLB Umpire Manual covers deflections and awarding of bases. The MLB Umpire Manual states, “If a thrown ball goes through or by a fielder, remains on the playing field and is subsequently kicked or deflected out of play (unintentionally in either case), the award is two bases from the time of the throw.” The rule is universal. Notice the rule states the base award for the runner/s is made from the time of the throw, not from the time of the deflection/s. As for awarding bases on deflected throws, it is treated as if the ball was never touched or deflected. Umpires must determine the position of the runner/s at the moment the ball is released by the fielder (Bauers). The runner/s are awarded two bases from their position on the bases meaning the last base that was legally touched. If a ball is intentionally deflected out of the play, runners are then awarded two bases from their position on the bases at the moment of deflection. If you watch the video provided by MLB.com, assuming everything is in proper sequence, you will notice that Realmuto had not reached second base before Bauers released the ball to Hechavarria. Therefore, Realmuto should have been placed at third base because the last base he legally occupied before the throw was first base. Instead, he was allowed to score which proved to be the winning run. In the past, I have recommended that someone in the dugout should be responsible for watching the position of the runners when the ball is released from the outfielder’s hand. The Rays had a good argument to keep Realmuto at third but failed to take advantage of it. Umpires and coaches should observe the position of the base runners the moment the ball is released by the outfielder. Normally, the plate umpire can make the base award because he is in position to see the whole play. On all levels of baseball, it is natural for everyone in the park to focus on the baseball, while unaware of what is going on in the under belly of the play. In the above play, too many eyes, including the umpires, were fixated on the ball while ignoring the position of the runners at the moment the ball was released by the fielder. The lack of attention to Realmuto’s position on the bases when the ball was released by Bauers, certainly impacted the outcome of the game since the Marlins won by one run. If a batted ball hits the ground or deflects off a wall it is no longer “in flight” and no legal catch can be made. If a fair, bounding ball is deflected into dead ball territory, the runners’ award is two bases from their position at the time the pitch was delivered unless the umpires judge that the fielder intentionally deflected the ball into dead ball territory, in which case the award is two bases from the position of the runners on the bases at the time of the deflection. The Los Angeles Dodgers and Philadelphia Phillies met at Dodger Stadium on June 29, 2013, when a rare kick deflection occurred. In the top of the sixth inning Ben Revere hit a shot down the right field line that deflected off Yasiel Puig’s foot when he accidentally kicked the ball into the stands on the fair side of the foul pole. At the moment the ball bounced into the stands, Revere was between first and second. Phillies’ manager Charlie Manuel incorrectly argued that Revere should be awarded three bases because he was between first and second when the deflection occurred or when the ball entered dead ball territory. The umpires properly awarded Revere second base because the deflection was judged to be unintentional. Therefore, the award of bases is made from the time of the pitch. If the umpires judged that Puig intentionally kicked the ball into dead ball territory, then the award would have been two bases from where the runners are at the time the ball was kicked or deflected and Manuel would have had a legitimate argument. Revere was on the other side of the rule one year later on Aug. 23, 2014, when the Phillies hosted the Cardinals. In the top of the ninth, Kolten Wong led off the inning by hitting a ball that bounced off the base of the center field wall. The ball then deflected off Revere and went over the wall. The umpires correctly awarded Wong two bases from the time of the pitch per rule 5.06 (b) (4) (F). Again, the rule is universal. The rule covers batted balls that are inadvertently deflected into the stands. If a batted ball remains “in flight” and deflects off a fielder in fair territory into the stands on the fair side of the foul pole, or strikes the foul pole, the play is ruled a home run. If a batted ball that remains “in flight” deflects off a fielder in fair territory and lands in the stands in foul territory, the batter-runner and all runners are awarded two bases from the base they occupied at the time of the pitch. 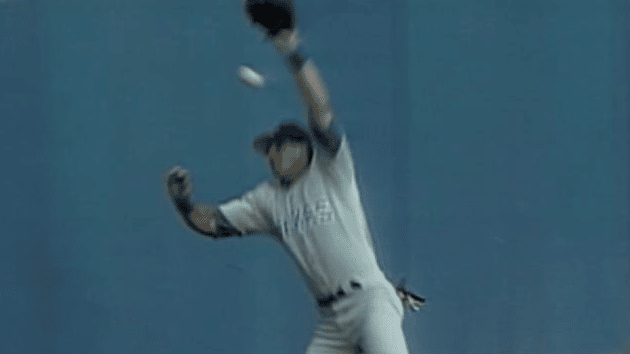 In the above play, because the ball struck the wall before it made contact with Revere, it was no longer “in flight”- thus the two- base award, even though the ball left the playing field in fair territory. It should be noted that if a fielder has complete possession of a batted or thrown ball and subsequently deflects or kicks the ball out of play, the award is two bases from the position of the runners at the time the ball was kicked or deflected. The rule is designed to give the proper penalty in rare cases where a fielder will intentionally deflect or carry the ball into dead ball territory to prevent runners from advancing extra bases.